Up to a hundred ingredients, such as chocolate, beans, raisins, flowers etc… go into the creation of a despacho, forming a beautiful natural mandala. Each symbolizes an aspect of our lives, with always a balance between the masculine and the feminine. All our prayers are blown into quintus (traditionally, coca leaves, but bay leaves for us in the West) for manifestation. 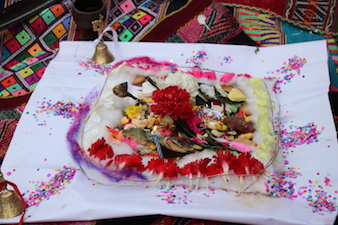 The bundle thus formed in a state of reverence and gratitude, is then burned, allowing our prayers to be released in the ethers and brought to the upper world by Condor and Pachamama (Mother Earth). The results of a despacho can be mild if we are already connected to our higher truth, or quite intense if we have strayed from our destiny. Coming in right relationship with aspects of our lives could initially lead to surprising results. We could be called to quit our job, move, see a love relationship come to an end or find ourselves temporarily without money. But all these occurrences, however dramatic they may seem at the time, will invariably lead to much better circumstances: such as the job of our dreams, the partner who matches us in body, mind, heart and spirit and greater abundance than ever. Greetings dear ones. It has been said that this is not a channel, but it is. I am Kryon of Magnetic Service and I am here to give a blessing in channel, for what you are about to do. You’re in a hotel room. There is carpet, you can’t see the sky. It doesn’t make any difference. For the intent of the human being is always the king of energy. The ancients greeted the planet whatever way they could, but they all knew one thing, that in the greeting of the planet, there is the creation of energy.